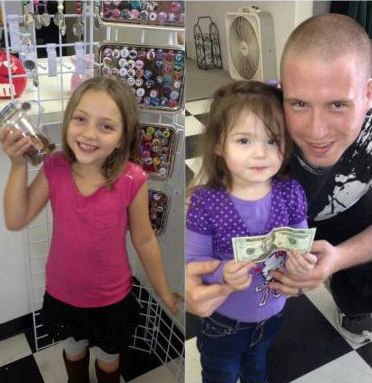 Dedicated to supporting our troops – past, present, and future – one wish at a time. Operation Once in a Lifetime was originally created to do just as the name implies – help make dreams (or wishes as many call them) come true for our troops. However, it wasn't long before we realized every request from a service member was a wish. We pride ourselves in doing many things that other organizations do to support our troops and their families, but we've added our own twist – we don't limit it! So many times our troops and their families are turned down from organizations that have funds to help but are turned down because they do not meet a certain criteria such as Service Members must be wounded, severely wounded, a certain rank, a certain branch, currently deployed or other criterion in order to be helped. Operation Once in a Lifetime knows you can't help every Service Member but we would rather tell a soldier and his family NO because we don't have the funds than NO YOU DON'T QUALIFY... If you are serving honorably or have honorably served, you qualify. Below are descriptions of our "Special Ops" -- what we do to support our veterans, troops, and their families, one wish at a time. Our "genesis" project, Operation Once in a Lifetime was created to provide once in a lifetime experiences for our Active Duty Service Members, Veterans and their families with the special once in a lifetime experiences that they would never otherwise get to have. The core belief Operation Once in a Lifetime has is that our troops have sacrificed so much of their time in defense of our country that we should at least give our troops opportunities to make up some of that time with their loved ones and fellow soldiers in truly memorable ways. Many of our troops come home with tough memories of war and loss of life combined with the guilt of having missed many important family life events such as anniversaries, birthdays, holidays and more. We often say when bad things happen to you, you have bad memories, but when god things happen to you, you have good memories. Our goal is to create as many good memories as possible for our troops. With your support, we have been able to grant thousands of wishes, including those of Army Captain Jeremy Lynn who was fighting terminal cancer and wished to visit New York City. 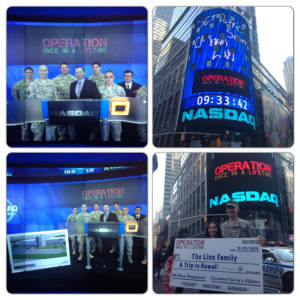 So when Operation Once in a Lifetime was selected to ring in the opening ceremony for NASDAQ in NYC, Captain Jeremy Lynn was there and participated in the ringing of the bell. We also found out that he had never taken his wife on a honeymoon so after the opening ceremony, Operation Once in a Lifetime surprised him and his wife with a honeymoon to Hawaii. 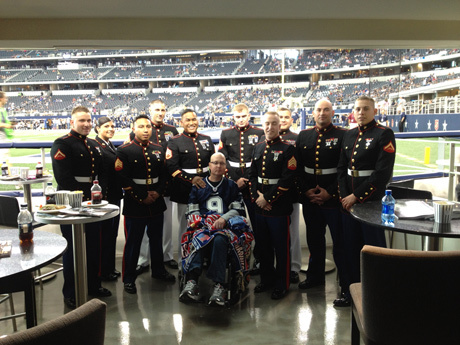 We also helped another terminally ill Marine whose wish was to go to a Cowboys game with his fellow Marines. These are just two of thousands of stories made possible because of the generous support of our donors. 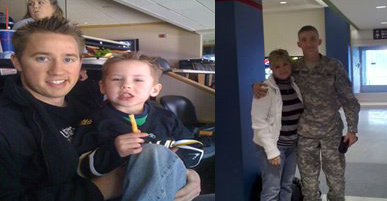 With more help, we hope to make more dreams come true for our troops. For every $3 donated, we can provide a pillow; for every $7 donated, a blanket; and for every $9 donated, a twin sheet set. Donations can be made online or new items can be dropped off at one of our local Support Your Troops Resale Centers in Plano or Killeen, Texas. 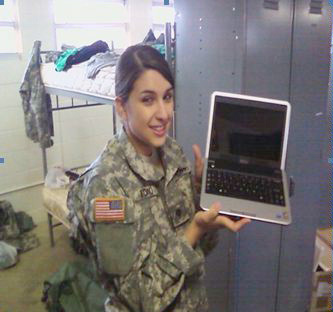 When deployed, almost nothing puts a smile on a soldier’s face more than receiving a package from home. Your donations help send requested items to deployed troops – from the necessities to Once In A Lifetime items Like TV’s, Xbox's, games and movies. If they request it, we try and fulfill it! Just recently, we were contacted by the Copperas Cove basketball team – made up primarily of military kids stationed at Fort Hood, Texas. They needed a little help for their team year end banquet. Wish granted! 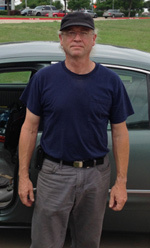 Hi, My name is Mr. Dixon, I'm a disabled (homeless) Desert Storm Veteran. I don't know if you can help me, but I'm trying to improve my situation and life by going back to school. I'm already enrolled at Motorcycles Mechanics Institute in Phoenix, AZ, scheduled to start on the 29th of this month, but I may not be able to go for the lack of $539 dollars that I need by the 18th to secure my housing to attend the school. I am not sure if you can help me or if a qualify but any help would be greatly appreciated." Operation Once in a Lifetime is proud to offer grants from the Rebecca Post Sikes Memorial Scholarship Fund. Description: This fund was established by Steven and Ursula Post in memory of their late daughter, Becky, who was a dedicated and loving military wife and mother to her three daughters. The fund provides scholarship assistance in the form of tuition and fees to military spouses who are pursuing higher education or training at both the undergraduate and graduate levels. Becky is remembered for her beautiful smile and contagious laugh. Along with her infectious positive attitude, Becky had a passion for education and continual improvement. 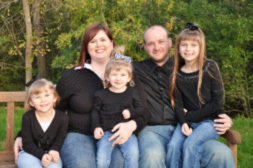 As the spouse of an U.S. Air Force sergeant who was raising three children while stationed overseas, time and money were limited and yet she was able to complete her undergraduate education and went on to receive a Masters degree. Steven and Ursula want to make sure other military spouses with a similar passion for education and development can get the financial assistance they need to afford their education. - Candidates must attend an accredited public or nonprofit independent college. - Candidates must be a spouse to an active duty military member or veteran. - Candidates must maintain a 2.0 GPA. Expecting a child is an exciting time. For most, this time includes a baby shower thrown by family and close friends. For a Service Member and/or their spouse, this isn't always possible as they spend years away from their loved ones, transferring from duty station to duty station. Operation Baby Shower was created to step in and assist with the makings of the almost perfect baby shower. Contact us to see how we can help make the expected arrival of your new little one a special event. Soldiers deploy all over the world -- Egypt, Germany, Korea and the Middle East -- but many of these soldiers do not get to come home. They do not get to come home because they cannot afford to fly home. Soldiers deployed overseas are responsible to pay for their own flights home. If a soldier was stationed in Germany with his family and had not been home in two years, he would have to pay for him and his family to fly back to the United States. Operation Once in a Lifetime has been able to fly hundreds of Service Members home over the past 7 years when the soldiers could not afford to fly home on their own. We would like to be able to fly every soldier home but we cannot do it without donated airline miles and funding. If you have extra airline miles, please contact us and donate them to a soldier. Help us fly every soldier home! The program that our Veterans, especially our Severely Combat Wounded Veterans, ask to participate in, is our SOLDIER OUTDOOR INITIATIVE PROGRAM which combines everything outdoors such as hunting, fishing, camping, hiking and more. We have taken thousands of our troops on once in a lifetime outdoor experiences that created truly memorable experiences that will last a lifetime. This program also helps bring together a sense of brotherhood that so many of our Veterans miss when they get out of the military because they get to enjoy these experiences with other Veterans. Approximately 60% of our homeless are veterans. 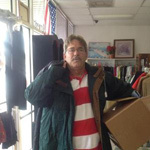 This past winter, a homeless veteran came into our Plano Support Your Troops Resale Center needing a warm place to stay for the night. The temperatures were dropping below freezing and the shelters were full. We believe no one – especially a veteran – should be sleeping on the streets. Due to your generosity, a hotel room was provided for the night along with clothing and food. Assisting with the needs of our homeless vets, from the day to day needs of toiletries and snacks to the larger needs such as temporary housing, clothing and furniture – THIS is what this Special Ops is all about. Provide a $5,000 motorized wheelchair for an injured soldier. Provide a 30 night stay for a soldiers family in a hotel as the soldier was having specialized surgery at MD Anderson for stomach cancer. Help a Marine combat veteran and now National Guard member when he was one day from being homeless. 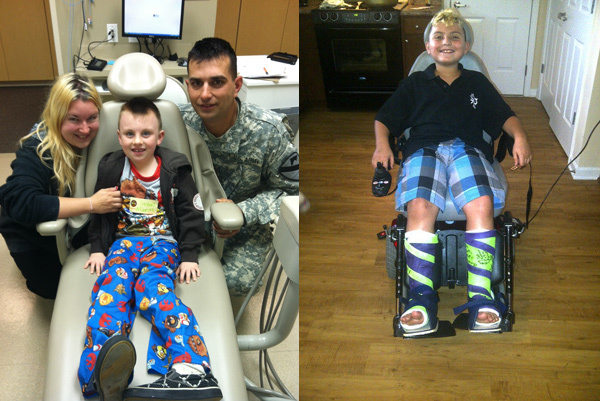 Help a military family by providing a motorized wheelchair for a debilitating condition that makes it hard to walk. Help with emergency dental work for a military child. While the soldier's dental care is free, the family’s is not. Operation Once in a Lifetime receives numerous requests during the holidays from military service members who need assistance providing a good Christmas for their kids. These requests come from the families of those soldiers that are currently deployed overseas, stateside and even from families that have lost a parent protecting our country. 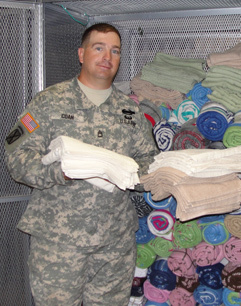 Operation Once in a Lifetime has provided toys for over thousands of military families in the past three years. Our Resale Centers serve many purposes. They are a drop-off center for donations, accepting gently used items for resale as well as allow us to provide for our troops and our veterans in need with items such as clothing, furniture and more. Did you know? 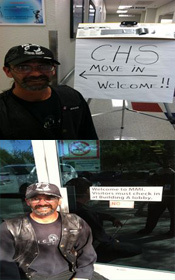 The Dallas VA brings homeless veterans by our centers to pick up items for their transition apartments that are bare. Service Members, Veterans and their families are welcome to come shop for needed items for free. Operation Once in a Lifetime helps thousands of military families on a daily basis from our 2 centers, even moreso since our Fort Hood location has started a Food Bank inside the center. We have amazing people on our side, assisting us as we assist our service men and women and their families. No donation is too small! Donate what you can, when you can. All items can be used – gently used furniture and clothing, new items, airline miles, event tickets – you name it, we can put it to use!